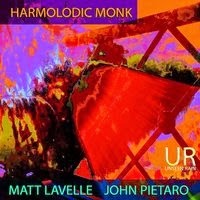 A very interesting album from Matt Lavelle and John Pietaro. The concept, and I love concept albums, is to use Monk compositions and Ornette Coleman’s harmolodic methods. Interestingly, we find John Pietraro on the vibraphone in addition to percussion leading to a unique duet. Matt Lavelle is found on his standard cornet/flugelhorn as well as alto clarinet which we have been seeing more of from Matt. A healthy offering at an hour and a half, Matt and John work their magic on recognizable standards, with a pleasant twist. Matt’s cornet and flugelhorn have never sounded better, bold and meaty, especially on the excellently executed “In Walked Bud”. Other standouts, “Blue Monk/ Straight No Chaser”, and the spacious and oozing with blues “Round Midnight”, showcase Matt on the alto clarinet. Recorded with an intimate feel it can be hard to remember you're not actually in the room with the musicians. Even though the album is worth hearing and adding to your collection, at 1 hr 33 mins it does tend to drag a little. I would have liked to hear more percussion mixed into the album, even with the strong performance of John on the vibes it was a challenge over the span of the album to keep focus. The cornet and flugelhorn, being the main instrument I’m familiar with Matt playing, were much stronger than his alto clarinet. Aside from his stellar showing on “Round Midnight”, I found myself preferring his sax playing. While not an album that I would return to every day, it is a performance and concept so unique and creative it should be investigated by fans who have yet to hear it. And even though it is not my favorite release from Matt, it reenforces my ever growing admiration for his playing and creativity.